This course covers how to start a construction company, how to develop a plan of business, basics in reading job plans, getting on bid lists, estimating and doing the estimate takeoff, including Preliminary Submittals, O&M Manuals, Contracts, and much more. School brings 30+ years experience in Small and Large Construction Experience for both Residential and Commercial companies. Enhance your knowledge in construction and advance your career, explore employment opportunities or open your own business. Course is self-paced and allows you up to one (1) year to complete the course, you can review the videos and power points as often as you want and develop forms for business. Construction is in every town and jobs are increasing by 18.1% per the Arizona Department of Labor. Construction Office Administrators are hired at many levels, they have specific skills in the trade. This course is full of training and learning those skills. Course is split with ONLINE training and 5 weeks of hands on training with an Instructor in the classroom. You will learn MOS and Basic QuickBooks. Begin with Construction Training online at home or in Eii’s Computer Lab, self paced. Advance to MOS Training online in Eii’s Computer Lab, self-paced. Then advance to in class hands on training with an instructor. Certificate program provides you with intermediate and advanced skills. Includes advances into many levels of training and skills. It includes 2016 Word, Excel, PowerPoint, Outlook. You will learn forms, presentations, workbooks, and how to maintain and operate Outlook. You will learn Basics of Construction Industry, Job Costing, Construction Billing, Basic Blue Print Reading, Job Take Off, WIP Reports, and more! This program is designed around Construction however, can be used in any industry. You have up to 6 months to complete the program with staff to help if needed. Course is self-paced and you can come and go as you please during office hours. 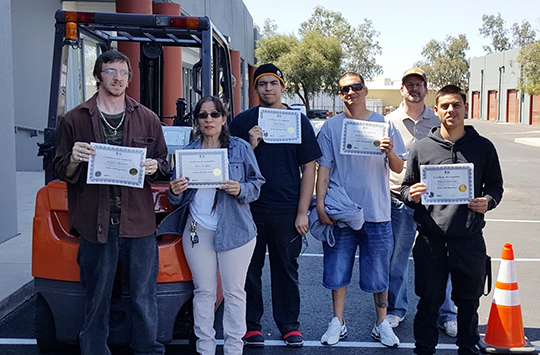 Here at EII Training in Tucson, we educate people and provide them with all the information needed to obtain their forklift certification training. 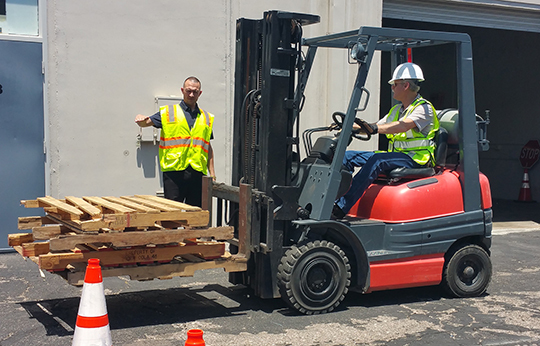 We believe all individuals who operate a forklift or are seeking to do so must be trained to remain efficient and compliant with OSHA law. Most industrial operations require that forklift operators, or powered industrial lift truck operators, be certified by OSHA (Occupational Safety and Health Administration). Job Opportunities require general industry workers to be OSHA trained. Many industries, companies, and insurance providers require that forklift operators, as well as other construction or general industry workers, be OSHA certified. Jobs are available in many industries, construction, warehouses, material suppliers, department stores, grocery stores, and many more! Class is taught by an OSHA Instructor, licensed by US Federal Department of Labor. Program is hands on and is added to our Forklift Operator Training course. Many warehouses, department stores, material yards, grocery stores, and many more specify Stand Up Forklift Experience. Now you can have it! Class is taught by an OSHA Instructor, licensed by US Federal Department of Labor. Being a flagger is the most important job on the work site. Careless use of the sign or distraction from duty could cause serious injury to workers or the motoring public. Performing flagger duties diligently can prevent traffic incidents in the work area. Highway Flaggers are in demand year around where ever highway construction projects are in effect for safety and to maintain traffic flow. This is a Certificate Certification Card Program. Your Certification Card is recognized nationwide by highway construction companies. Most will not employ you without this card. If you like great pay and enjoy traveling around our country, this is the program for you. Have a phone and transportation? Then all you need is this one day training program. OSHA recommends Outreach Training Program courses as an orientation to occupational safety and health for workers covered by OSHA 29 CFR 1926. Workers must receive additional training, when required by OSHA standards, on the specific hazards of the job. This training is designed for employers, foremen, supervisors, and employees.